With just eleven and half weeks for the film to go on floors, the makers of Shraddha Kapoor & Arjun Kapoor starrer Half Girlfriend, have divulged some more trivia about the film. The lead cast, along with director Mohit Suri and author Chetan Bhagat, shared that the city of New York forms an integral part of the filming of Half Girlfriend. The cast and crew of the film had an extensive shoot schedule in the city, where they shot a very important and conclusive chapter of this cinematic adaptation. They shot the film’s climax with Arjun on the Brooklyn bridge which has a two-helicopter set-up above the iconic New York landmark, at dawn to capture the city in a new light. 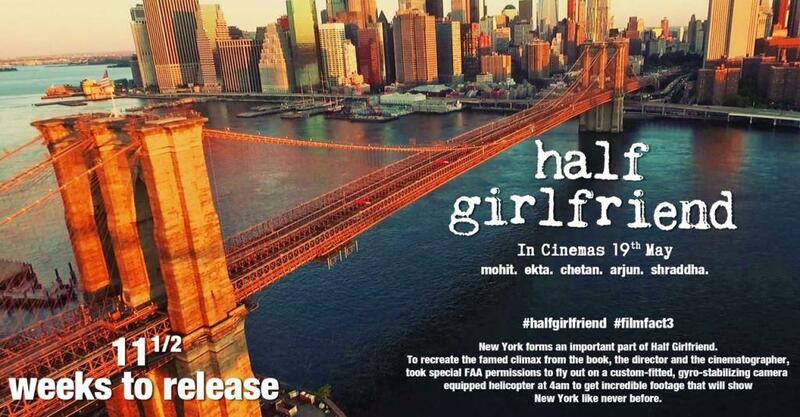 The team of Half Girlfriend revealed that to recreate the famed climax of the book, director Mohit Suri and cinematographer Vishnu Rao, took special FAA permissions to fly out on a custom-fitted, gyro-stabilised-camera equipped helicopter at 4am to capture some of the most incredible footage that will show New York as never before. Half Girlfriend, which is an adaptation of Chetan Bhagat’s eponymous novel is slated to release on May 19, 2017.